No therapeutic approach to pain management is satisfactory until body posture is generally improved. Whatever the cause of the client’s problem, special focus should always be given to posture. Overall body alignment may seem time consuming and is therefore frequently neglected because both therapist and client are often content with immediate symptom alleviation. In recent years, however, the manual therapy community has been blessed with scientific advances spearheaded by researchers such as J. Gordon Zink (Common Compensatory Pattern)1 and Vladimir Janda (Upper and Lower Crossed Syndromes)2 which has sparked renewed interest in the neuromyofascial formation of commonly seen postural patterns. As a result, practical new structural balancing approaches have surfaced that not only save time but also offer more satisfying long-lasting results. By integrating these new strategies, the demands for structurally-trained pain therapists increases as chronic sufferers find relief from long-standing musculoskeletal ailments. This ultimately sets these bodyworkers apart in the eyes of clients and referral sources. For today’s touch therapist to gain a basic understanding of how distorted postural patterns lead to chronic head, neck and back pain, the concept of perfect posture must first be defined. Simply put, perfect posture is a condition where body mass is evenly distributed and balance is evenly maintained during standing and locomotion, i.e., “body mass is evenly dispersed in relation to gravity over a given base of support.” Since our bodies are eloquently designed to react to any shift in center of gravity through sophisticated somatic mechanisms, if the normal function of any part of the mind/body system becomes overstressed, a vicious cycle of pain and dysfunction begins. Structural alignment pain therapists seek to restore normal mobility to all components of the somatic system by correcting postural imbalances to minimize compressional loading from gravitational exposure (Fig. 1). Each of us is affected by the mysterious and potentially stressful force of gravity. If, for a moment, we assume that posture is the result of the dynamic interaction of two groups of forces acting on the human body—the environmental force of gravity on one hand and the strength of the individual on the other—then posture could be considered as the ideal expression of balance between these two groups of forces. Therefore, any deterioration of posture indicates that the individual is losing ground in the contest with gravity’s unrelenting power. Postural homeostatic lessons are learned early in life by the central nervous system (CNS). Visual and proprioceptive input continually supplies the toddler with the necessary information for growth and development. Normally, as a child progresses into adolescence, compressive forces on spinal intervertebral discs and facet joints are beautifully balanced through ligamentous tension allowing minimal energy expenditure from postural muscles. However, structural or functional body stressors (tension, trauma, genetics, etc. 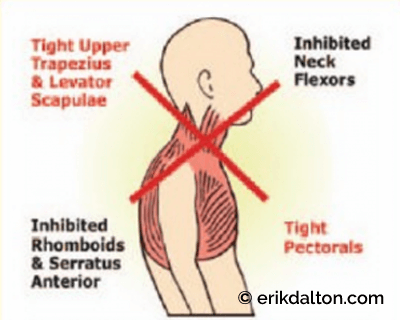 ), may prevent achievement of optimum posture. 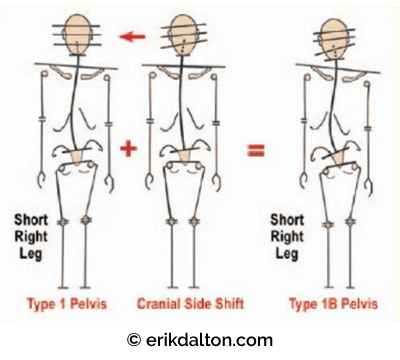 Faulty posture from physical occurrences such as leg length discrepancies, cranial imbalances, and scoliosis alters the body’s center of gravity which requires mechanical adjustments (compensations) leading to muscle, fascial and osseous adaptations (Fig. 2). Figure 2: Notice in the Type 1 pelvis how the cranium has successfully compensated of the short right leg and sacral base unleveling. When cranial side shift is added, the entire structure decompensated leading to pain syndromes. Reprinted from Ross Pope with permission, 2005. If a joint’s mechanical behavior is altered, flexibility and range of motion suffers. The increase in mechanoreceptor stimulation from chronically locked joints results in neuroreflexive muscular changes, i.e., protective muscle guarding. Long-standing over-activation of abnormal joint reflexes causes changes in spinal cord memory that eventually “burns a groove” in the CNS as the brain and cord are unknowingly saturated with a constant stream of inappropriate proprioceptive information. Regrettably, the brain comes to rely on this faulty information about where it is in space to determine how to establish perfect posture. The brain simply forgets what its alignment should be. Many of us have experienced the distress of standing in a three-way mirror trying on a suit or dress when suddenly a shocking profile appears. We ask ourselves where, when and how did this protruding belly, slumped shouldered and accompanying forward head posture develop? 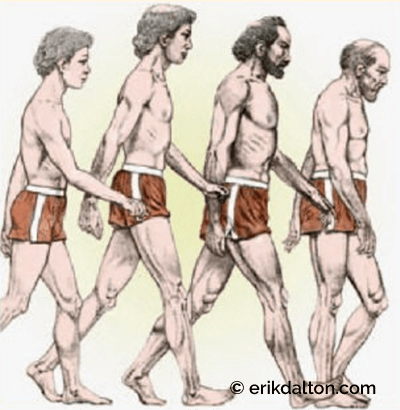 The silent progression of aberrant postures is all part of the reflexogenic relationship between muscles and joints. 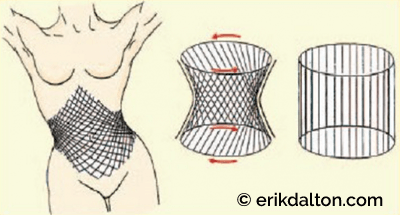 Figure 3: Trunk stabilizers form a perfect antigravity cylinder support system that lifts the thorax with each step. Courtesy of Erik Dalton. Some humans appear genetically blessed with optimal posture—where muscles are not actively working as restraining tissues, ligamentous tension is perfectly balanced against compressive and tensegrity forces—and normal everyday activities such as standing and walking require minimal energy expenditure. Buttressed by a dynamic anti-gravity tensegrity system, tensional and compressive forces are evenly dispersed through the entire organism. The ligamentous pelvic bowl is a key structure and part of an eloquent myofascial web designed to transmit forces from above and below during locomotion. When working properly, trunk stabilizers such as transversus abdominis, thoracolumbar fascia, multifidus, and pelvic/respiratory diaphragms form a perfect antigravity pump that lifts the thorax with each step (Fig. 3). In the presence of normal spinal curves, the body’s bony framework is effectively supported and moved by this remarkably elastic myofascial network. As the person walks or runs, the antigravity springing mechanism decompresses intravertebral discs and facet joints allowing lubricating synovial fluids (metabolic substrates) to be sucked in (Fig. 4). Gluteus medius and minimus are excellent examples of the power generated by tensegrity muscles. Regrettably, they are possibly the least appreciated and most important of all of the body’s antigravity structures. 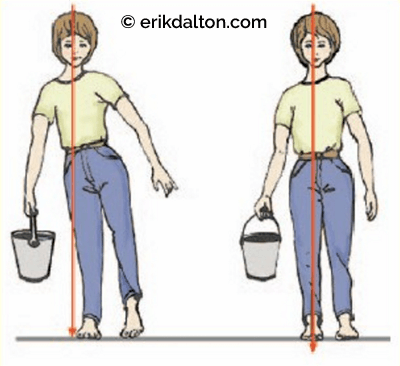 When firing in proper order (during the stance phase), these primary hip abductors must elevate the contralateral ilium to allow the leg to swing through preventing the foot from dragging the ground (Fig. 5). 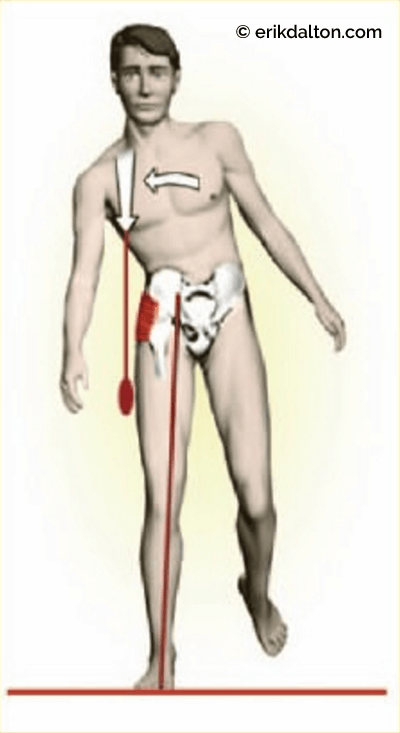 Figure 5: In the normal walking cycle, the right gluteus medius/minimus must fire first to elevate the contralateral ilium (right pelvic side bending) so the left leg can swing through. Courtesy of Erik Dalton. Ideally, during the static act of standing, postural muscles are in a state of normal tonus and not actively contracting. In reality, however, most people have less-than-perfect postural balance and as a result, active muscular contraction is required to redistribute body mass and effectively hold it in place. Muscles are now working against gravity and performing the job of ligaments as they are forced to stabilize the spine. If a person’s homeostatic threshold has been violated, tonic postural muscles tighten and shorten while their phasic antagonists become overstretched and weak. Asymmetric patterns develop and soon the antigravity function of the body’s myofascial system collapses sending warning alarms to deep intrinsic structures such as spinal ligaments, joint capsules, and intervertebral discs to brace against the onslaught of overbearing compressional loads. Because locomotion requires the controlled loss and regaining of balance, movement of any body part with respect to the rest of the body shifts its centerline of gravity, causing an inevitable change in overall balance. Muscle and ligamentous tension is maintained by negative feedback from sensory receptors located in joint capsules, ligaments, fascia, and intervertebral discs. Structural asymmetries increase sensory information to the CNS which is then interpreted and reflected in predictable asymmetrical postural patterns such as Vladimir Janda’s upper crossed syndrome (Fig. 6). An enormous amount of information can be gleaned by manually and visually assessing for these postural irregularities (Fig. 7). Observation of posture provides the clinician with the first and most important clues to the client’s overall physical, emotional and psychological condition. Figure 6: Vladimir Janda’s upper crossed syndrome. Reprinted from Ross Pope with permission, 2003. Figure 7: An enormous amount of information can be gleaned by manually and visually assessing for asymmetries such as forward head postures. Courtesy of Erik Dalton. For the body to sail smoothly through life, it must have the ability to repair, regulate and protect itself. Humans possess a complex self-regulatory mechanism that allows for adjustments to environmental stresses while maintaining homeostasis in all systems—myofascial, skeletal, nervous, circulatory, endocrine, etc. These compensatory mechanisms work to keep the body in balance regardless of what works upon it or what happens around it. Although innate compensation is obviously a much needed protective device for repairing worn out parts and maintaining bodily homeostasis, its role in maintaining posture is often confusing as overlapping strain patterns accumulate. In simple terms, compensation is the counter-balancing of any defect of bodily structure or function (Fig. 8). Compensated postures are the result of an individual’s homeostatic mechanism working smoothly even though they exist within a body exhibiting less that ideal posture. Fortunately, this neurologically hard-wired compensatory mechanism allows the person to operate as efficiently as possible in less than perfect circumstances. Most clients entering our workplace are compensated in one way or another. In the early stages, the individual with structural compensation appears to function normally despite some occasional aches and pains. When physical injury occurs, local myofascial structures tighten (splinting reflex) allowing the body to compensate and continue on its journey—safely, healthfully and productively. Regrettably, as time passes, these compensations accumulate and integrate into myofascial, osseous and visceral systems. Repeated traumatic physical episodes also leave emotional scarring that buries deep within our self-regulating energy system. Micro or macro traumas never leave the body but infiltrate and integrate into every cell and system of the organism. In time, these compensations surface and are visually reflected in every step taken. Figure 8: Compensation posture from sustained compressional loading. MediClip, Lippincott, Williams & Wilkins, 2006. When an individual’s homeostatic thresholds are overwhelmed, decompensation occurs. 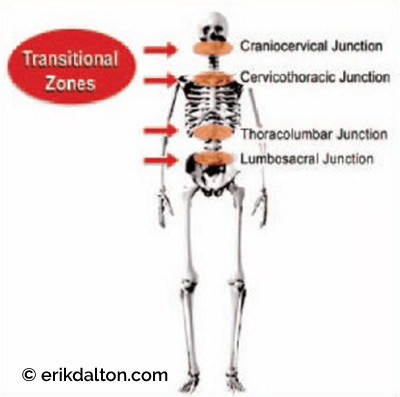 The most destructive postural adaptations occur at the four transitional zones (cervicocranial, cervicothoracic, thoracolumbar, and lumbosacral). These critical cross-over junctions are areas where anatomical structural changes create the greatest potential for neuromyoskeletal dysfunction (Fig. 9). By developing acute visual and palpatory skills, therapists can quickly become proficient in monitoring and correcting regional zone asymmetry in clients. 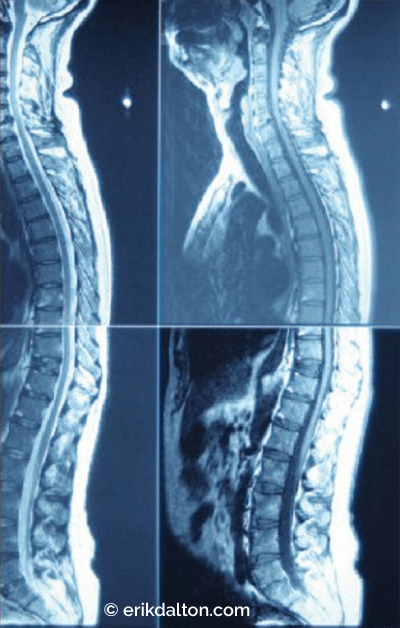 Many find that assessing and correcting transitional zone decompensations alone produces surprisingly dramatic postural improvement and helps attune therapists to the visual art of unraveling complex strain patterns. Because of an accumulated history of genetic, traumatic, and habitual processes requiring compensations—in the real world—few clients actually present with ideal posture. Figure 9: Critical cross-over junctions portend the greatest potential for neuromyoskeletal dysfunction. Reprinted from Ross Pope with permission, 2003. Deep intrinsic postural muscles such as the iliopsoas, quadratus, transversus abdominis, and multifidus contain more slow-twitch fibers and prefer burning oxygen for fuel (oxidative metabolism). These tonic muscles have a higher capillary density than extrinsics (rectus abdominis, rhomboids, lower trapezius, gluteals, etc.) and are better designed to withstand sustained compressional loads during normal activities such as standing and walking. Since tonic (postural) muscles have more high-density slow-twitch fibers, they react to functional disturbances by shortening and tightening. Problems appear when the muscle shortening process compresses and twists spinal joints. In the presence of joint dysfunction, the muscle spindles’ gamma system can neurologically weaken the transversospinalis and erector spinae muscles creating scoliotic patterns. As deep intrinsic muscles become spasmodic, their fascial bags react by forming contractures. This leads to a loss of oxygen fuel causing muscle fatigue and eventual collapse of the body’s antigravity system. The compressive load must then shift to the extrinsic (phasic) muscles. Phasic shoulder girdle muscles such as the rhomboids, lower trapezius, posterior rotator cuff, serratus anterior, and triceps brachii are usually the first to respond. Since these tissues contain a greater number of fast-twitch fibers, they are dynamic and emit bursts of energy. However, their reliance on glucose for fuel (glycolytic metabolism) causes them to fatigue easily. As the supply of glucose diminishes, the extrinsics “give-out” and reluctantly shift the load back to the already overworked and exhausted intrinsics. Many aberrant postural patterns entering our practices belong to bodies screaming out for help—either because they are in an intrinsic or extrinsic stage of collapse (Fig. 10). Figure 10: The progression of aberrant strain patterns and their effect on structure. Courtesy of Erik Dalton. The issues of faulty posture are often magnified in athletic clients. Imbalances such as short-leg syndromes resulting from a tilted innominate or pronated foot can dramatically reduce speed, strength, coordination and endurance. Moreover, an athlete’s joints are often subjected to abnormal mechanical stresses. 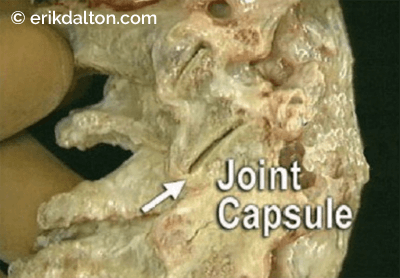 Alterations in joint function caused by capsular restriction or loss of joint play either inhibit or facilitate muscles that cross the misaligned joint.3 Muscle imbalances occur as the length-tension relationship surrounding a given joint is disrupted. Maintain a good aerobic exercise program. Electromyographic studies have repeatedly demonstrated how alterations in the proper sequence of muscle activation (firing order) adversely affect speed and coordination in competing athletes. Clinically, it has been found that in some athletes, inhibition of dynamic extrinsic muscles—commonly due to joint dysfunction— may be so great, that attempting to strengthen the inhibited muscles through resistance training may only serve to further intensify the inhibition.4 This is a vital piece of information for the sports therapist. The bottom line is to first create myofascial balance and restore proper joint function before recommending strengthening exercises. Once muscle balance, posture, and pain-free movement have improved, the client can resume resistance retraining and aerobic exercises. Because muscle contraction requires energy, postural imbalances drain energy in proportion to the magnitude of the imbalance. This is wasted energy, energy unavailable for its original purposes. Energydrains dramatically affect the limbic system—the highest cortical level regulating muscle tone. As whole-body tension builds, therapists begin to see energy-draining symptoms reflected in conditions such as fibromyalgia, chronic fatigue syndrome and digestive or hormonal disorders. It has long been known that psychological factors play a large part in creating distorted postures through selective tightening of specific muscle groups. The word “uptight” is an expression commonly used to denote that feeling of tightness, stiffness and fatigue. The power mantra: Poor posture is always perpetuated as tight muscles become tighter—weak muscles become weaker—and CNS motor control becomes disrupted. If not properly assessed and corrected, this commonly seen postural progression leads to agonizing, self-perpetuating pain/spasm/pain cycles. G.J. Zink,“Respiratory and Circulatory Care:The Conceptual Model,” Osteopathic Annals (1997): 108-112. V. Janda,“Evaluations of Muscular Imbalance.” Rehabilitation of the Spine 2nd edition ed Craig Liebenson (Lippincott,Williams & Wilkins, 2006), 203. V. Janda,“Muscle Weakness and Inhibition in Back Pain Syndromes,” In Modern Manual Therapy of the Vertebral Column ed. Gregory P. Grieve (Churchill Livingstone, 1986), 197. F.P. Kendall and E.K. McCreary, Muscle Testing and Function (Williams & Wilkins, 1983).